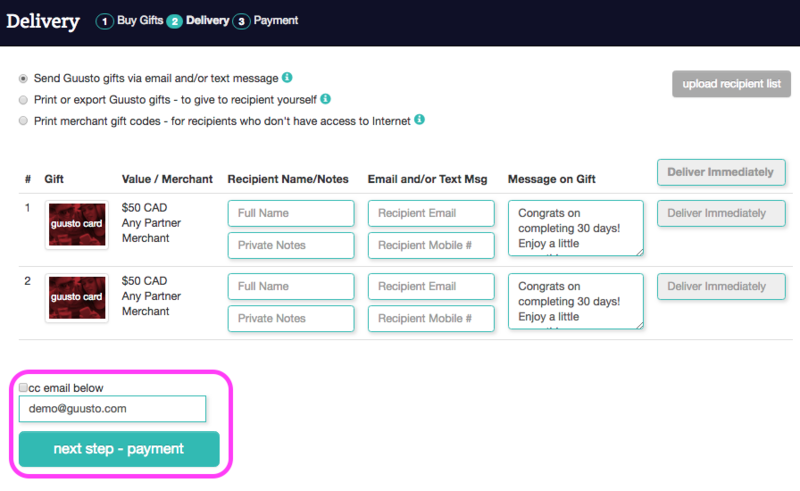 How do I send gifts using Web Platform? 2. Click "Buy Gifts" in left-hand navigation menu. 3. 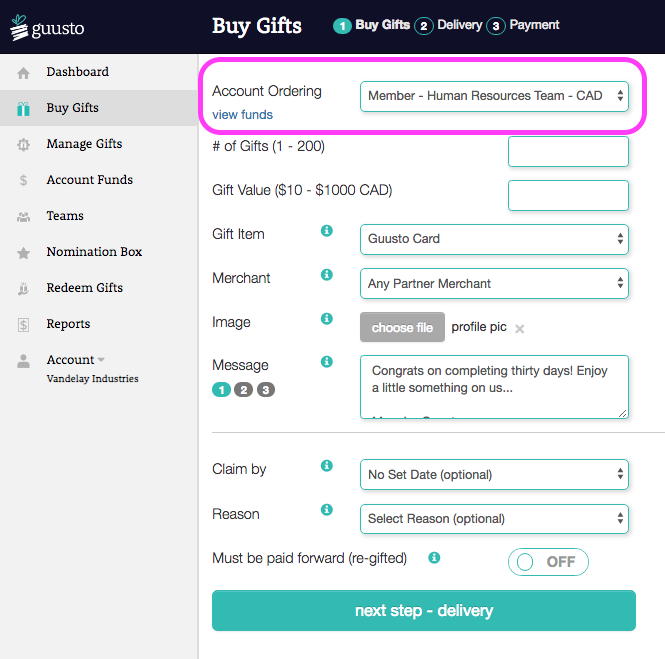 Account Ordering - select which account you wish to order from (click "view funds" link to see funds you have available to make purchases). 4. Buy Gifts - fill out order info and click "next step - delivery". #of Gifts can 1-200 gifts on any order. Gift Value can be anything $10 - $1000 (merchants have minimum $10, recipient can split their gift across multiple merchants). Gift Item indicates the type of gift you'd like to provide (Guusto Card is most flexible, see where each can be redeemed). Merchant can be selected, but most users leave it as "Any Partner Merchant" to allow recipient to choose. Image will default to your Profile photo, but you can load a different one. Message will let you customize the message on the gift, or you can choose from some default message saved in your Profile. Claim by allows you to set a period in which the gift must be claimed before it is automatically cancelled and fully credited back to the sender's account balance. Reason allows you to select a Reason for the gift (learn how to customize list). 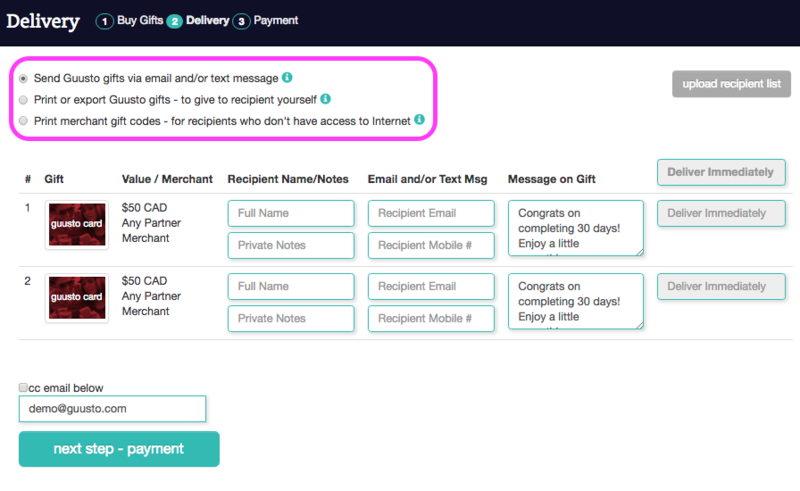 Must be paid forward, if turned on, will mandate that the initial recipient pass the gift to someone else (learn how you can track who claims gift). Send via email/text message - fill in the recipient details. Print or export gifts - deliver the gifts yourself, and the recipient will have a web link they can access online to choose a merchant and redeem. Print merchant gift codes - deliver a physical gift print out for a specific merchant if recipient does not have email address or access to internet. Full Name - recipient first and last name. Private Notes - any notes you want to make about the recipient, which they will not see (e.g. which store they work at). 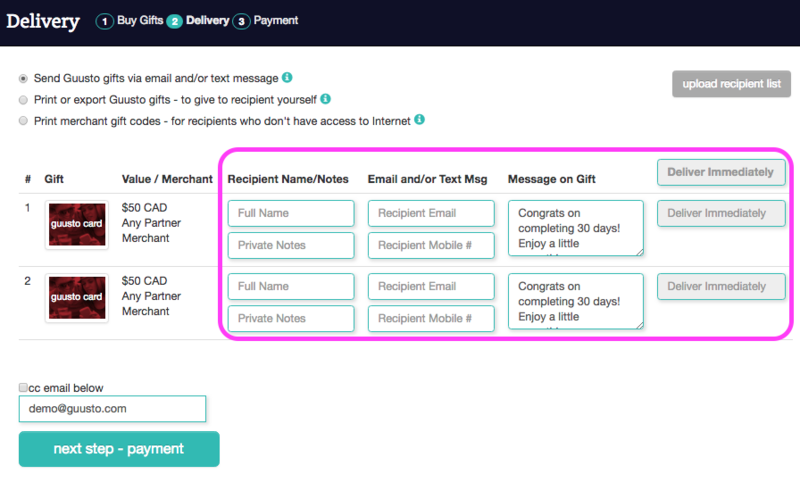 Recipient Email - they will receive email with gift. Recipient Mobile # - they will receive text message with gift. Message on Gift - you can customize each message if desired. Deliver Immediately - you can schedule each gift for a different date, or use box at the top to apply delivery date to all gifts. 6. 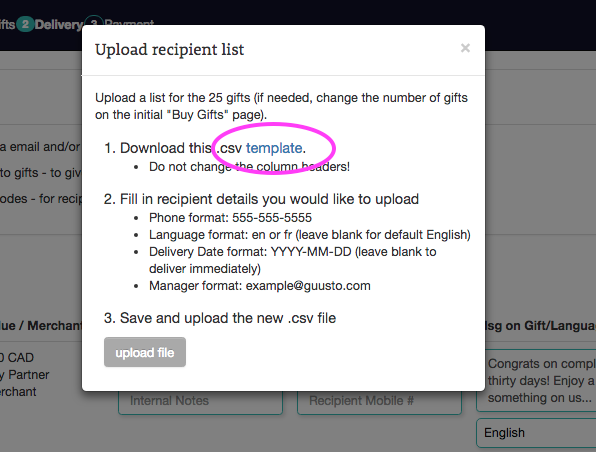 Delivery (optional) - upload recipient list if sending lots of gifts to save time (click the grey button in top right corner and follow the 3 steps). Learn more. 7. Delivery - if you'd like to be cc'd on gift emails, tick box and enter email, then click "next step - payment". 8. Payment - review order details, your available account funds, and click "confirm order". 9. 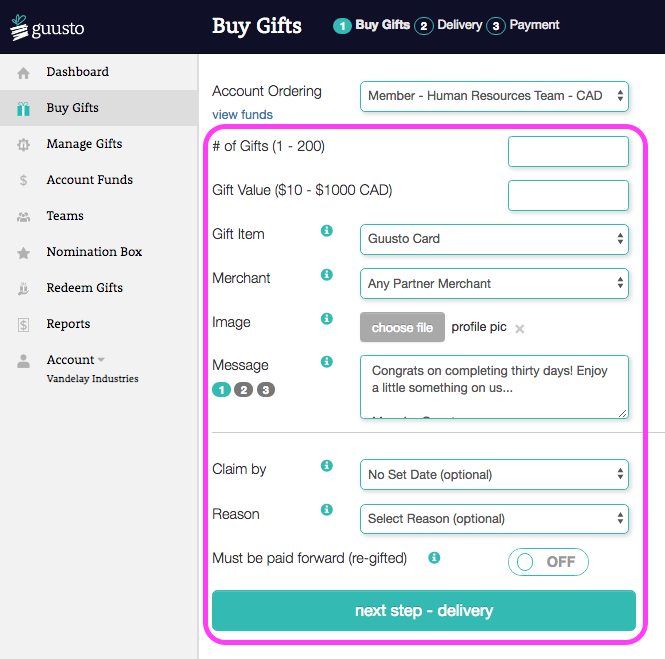 Order Confirmation - get order summary, use optional additional tools, go to "manage gifts" to see and manage all your sent gifts (learn more). Print Gifts - to provide physical gifts to recipients (you can also do this from Manage Gifts section). Export Gifts - to send gift links using a separate system (you can also do this from Manage Gifts section). Notify Colleagues - just enter email addresses to keep some colleagues in the loop on who you just recognized with gifts. How does the Manage Gifts page work?